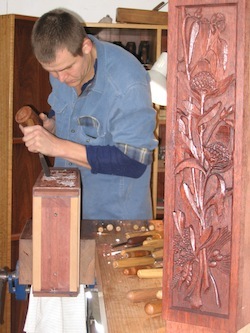 Myles runs weekend classes in carving and woodwork from his Tharwa workshop. Each 2.5 day class is based on a project of your choice. Classes cater for all levels of experience, whether you are a beginner seeking an interesting hobby or a long time woodworking enthusiast looking to hone your skills. Numbers are limited to six students per class, ensuring ample one-on-one time with Myles. This project is to carve a small three dimensional object employing techniques similar to those used in carving Japanese Netsuke. Students will learn how to reference from a clay or plaster model to carve their piece in timber using carving gouges and chisels. They will also have the opportunity learn about the different methods of securing the work piece while carving with a mallet. This project uses relief carving techniques to make a decorative panel which could be used for the lid of a small box or as a wall hanging. Relief carving is all about using light and shadows to create depth in an image and students will explore the different methods of achieving this, using carving gouges, chisels and punches or frosters. The use of text or lettering is also something that gets coverage in this project as personalised nameplates or shingles are popular. The topics covered in each these classes are very similar and will be useful whatever the type of carving you would like to do. Design concepts and the principals behind what makes for a good carving. Modelling and methods of transposing your design to the block of timber. Material choice and selection. What makes for a good carving timber and how to choose the right one for your carving. Woodcarving tools - the different types and how they are used. Sharpening techniques, bench stones, leather strops and tool maintenance. Carving techniques using a mallet and the correct carving grips to use carving gouges safely and efficiently. Carving vices and securing your work piece. Carving efficiency - when and how to use the different tools. Detailing the carving through the use of textured surfaces and other materials like bone, horn or shell to make eyes etc. Finishing the carving off using oils and waxes. The aim for each of these classes is for students to come away from the weekend with a finished piece or at least all the skills, knowledge and confidence to continue carving safely at their own pace. Saturday and Sunday session from 8:00am to 5:30pm with a half hour lunch break. © Myles Gostelow. All rights reserved.